My family's excellent adventure to better health! This salad was an experiment for my Rouxbe cooking course that was a success. I learned that even vegetables that we don’t traditionally eat raw are crisp, fresh tasting, and surprisingly delicious with little to no fuss. This was not a dish I would normally prepare and it may push me to try more raw food dishes in the future. It was much more colorful and beautiful in person then I could capture in the photo even though I went outside to use the natural light. As a bonus, root vegetables are loaded with vitamins and minerals, folic acid, and are high in fiber, and low in calories! About 1\2 parsnip, julienne cut or shred in food processor. Grind or finely chop the walnuts , mix with lemon juice, mustard, and a pinch of salt if desired and set aside while you prep the veggies. Prep your veggies, sun dried tomatoes, and berries. Place the kale into a large bowl and add the lemon walnut mixture and massage the kale with your hands for a couple of minutes until the kale starts to soften. Toss the veggies, garlic, and berries with the kale, plate your dish and top with pumpkin seeds or whatever seeds you have or like. All of the veggies in this dish were from my weekly CSA from Lackawaxen Farm Company. It has been a great adventure getting new vegetables every week and finding ways to incorporate them into our meals. It is coaxing us to eat more seasonally, is a great value, and is a lot of fun! Remember to have fun with your food and enjoy! Categories: Recipes | Tags: health, kale, nutrition, salad, vegan, vegetables, whatveganseat | Permalink. Meet Mike: An unintentional self study in health and wellness! Meet our friend, Mike Vasey! We met Mike and his wife over 30 years ago when my husband was a student at Penn State University. We reconnected recently online and much to our surprise, we had both stumbled upon the news that plant-based eating can not only prevent, but also reverse many chronic illnesses. As a university professor and critical thinker, Mike was attracted to the science behind the positive effects of a plant-based diet. One problem with the many positive testimonials regarding the health impact of a plant-based diet is that one cannot be completely confident the dietary change was the cause of the improved health. Don’t get me wrong, I find it pretty compelling when longstanding conditions change when diet changes. But one still lacks a hypothetical counter factual – a way of estimating how the person would have done without the dietary change. That’s where controlled experiments come in. One way to add a hypothetical counterfactual is to reverse the change to see if weight, cholesterol, etc. go back to where they were before one started. Then one can re-institute the dietary change and see if things improve again. That is known as an ABAB single-subject research design (A = baseline, B = intervention). Unintentionally, over the past five years I have done such a reversal study on myself regarding the impact of a plant-based diet with no added oil. Five years ago I chanced upon a local broadcast of a talk by Dr. Caldwell Esselstyn, Jr. on reversing and preventing heart disease with diet. I have a strong family history of heart disease – my father had at least five heart attacks – so the topic piqued my interest. I found Dr. Esselstyn’s data compelling so I decided to give it a try. At the time my total cholesterol was 200 (it had reached a high of 237 some years earlier, which prompted some improvement in my eating habits [translation: I ate less sausage and similar things]). My weight was about 208. I am about 6′ 2″ so my BMI was 26.7. With very rare exceptions I was successful in following the Esselstyn diet. It took about six weeks before I found it to no longer be a challenge. By then, I had identified things I liked to eat and had modified recipes to be oil free. It helped that I tend to eat the same thing for breakfast and lunch every day so once I had those two meals figured out (oatmeal with bananas and dried cranberries for breakfast, a big salad for lunch) only supper was an issue. I tended to cook a few one dish meals (e.g., lots of soups) on the weekend and eat them during the week. Between meals I snacked on fruit and veggies. Based on Esselstyn’s book , I expected things to change fairly quickly and mostly they did. I was on two blood pressure medicines at the time, mostly to control cluster headaches but also due to mild hypertension. Within two weeks of eliminating oil from my diet my blood pressure dropped to the point that I was light headed when I stood up. With my doctor’s consent I dropped the med that was unrelated to cluster headaches and things went back to normal. Simultaneously I started losing weight. After one month my weight was 196 (BMI = 25.2) but my total cholesterol hadn’t changed much, dropping only to 180. After six months I had lost 27 pounds to 181 (BMI = 23.2) so I expected my cholesterol would follow suit. However, when I completed a biometric screening for work at the six month mark, my cholesterol was still 180. That was a bit discouraging since my goal was to get it below 150, the threshold below which nobody in the Framingham Heart Study had a heart attack. But I kept at it and after a year and a half my total cholesterol was 154, which was very near my goal. And my weight was down to 172 (BMI = 22.1). Eventually my weight bottomed out at 170 (BMI = 21.😎) and my total cholesterol stayed below 130. Then about 18-months ago, I went through a prolonged stressful period and I got lazy regarding my diet. I essentially went back to baseline in terms of my diet. I tended to eat whatever was easiest and that was often something processed and high in fat. Predictably, my weight went up until it was 196 (BMI = 25.2) at my annual biometric screening on 9/12/16 and my total cholesterol was back up to 198. Added to that, my A1C was 6.1, which is borderline diabetic and diabetes is something else that runs in my family. Needless to say, those numbers got my attention. So I immediately went back to the all plant-based, no added oil diet. After nearly five weeks I had my blood work redone by my doctor. My total cholesterol had dropped by 27 points to 171, my weight was 188 (BMI = 24.1), and my A1C was down to 5.5, which is still high but in the normal range. Between then and now (12/26/16) I spent a week in Belgium and while eating plant-based was mostly possible (hey, beer is plant-based! ), forget the no added oil part. We also had Thanksgiving and Christmas and I must admit to straying a bit with all the holiday goodies around the house (my family does not follow my diet and that can be challenging at times). Nevertheless, my weight is now down to 182 (BMI = 23.4) and I expect it to keep dropping. I’m sure my cholesterol and blood sugar will follow suit. I’m glad to be back on a healthy path. Categories: Success story | Tags: DrCaldwellEsselstyn, health, nutrition, plant based, Plant based diet, plantstrong, support, vegan, weight loss | Permalink. Why is Nutrition Ignored in Medicine? Free program at TCMC Wed November 30th at 5:30 p.m. “Why is Nutrition Ignored in Medicine?” by T. Colin Campbell. This is part of the Preventive Medicine Lecture Series at The Commonwealth Medical College. There will be continuing Education Credit for medical professionals, too! Open to the public and all are welcome. For out of towners, Scranton is about two hours away from Philadelphia and NYC. CALL OR GO TO THE WEBSITE ON THE FLYER BELOW TO REGISTER. YOU WON’T WANT TO MISS THIS GREAT PROGRAM! Categories: Education | Tags: health, nutrition, plant based, Plant based diet, Plant Pure Nation, T Colin Campbell, vegan | Permalink. My husband was craving noodle soup this week and I finally decided to make it for him. Two bowls later, I’m not sure if I really made it for him, or for myself! One of my favorite soups is the Vegetarian Tom Yum soup at our favorite local Thai restaurant but I have not been able to recreate it. I prefer to make soup at home when I can since the restaurant versions are usually higher in sodium and it’s fun to experiment and have a new soup every time I make it. The first time I attempted a Thai soup, I used a recipe that a friend shared with me but it didn’t have quite the zing we were looking for. Finally, my husband Scott said he thought some fresh lime juice would give it that missing flavor we were craving. I don’t expect this will be the same soup the next time I make it, and I hope that if you make it, you will play with it and make it your own. You can use whatever veggies you like or have in your fridge, add and subtract ingredients as you like and share it with your friends and family! Here is my version of Tom Yum Soup which I call “Scott Yum Soup” named for my husband Scott. I finally looked up Tom Yum soup and it appears I am missing lemongrass, so maybe next time! Optional: Cubed tofu (extra firm) I like to use an 8 oz pkg of already cubed tofu tofu to make the job quicker. You can use the tofu plain, but I like to drain it and add a splash of low sodium soy sauce, sprinkle the tofu with Chinese Five Spice and bake it on parchment paper for about 20 min at 450 degrees in my toaster oven. 2. Add the green onions, carrots, mushrooms, fresh ginger, bok choy, soy sauce and miso and bring to a gentle boil and cook for 5-10 minutes. 3. Turn the burner off, then add the tofu and the noodles. The rice vermicelli I use just needs to sit in the hot broth for about 2 min. Be sure to follow the directions for whatever kind of noodles you use. 5. Add the sambal oelek, use less if you don’t like spice and more if you love it! 6. Add the lime juice and zest and serve! 7. Serve with extra Sambal Oelek , cilantro, and fresh lime wedges or slices if desired. A second bowl? I think I will! Always remember to– Have fun with your food and enjoy! Categories: Recipe | Tags: plant based, Plant based diet, soup, thai, tofu, vegan, vegetables, veggies, whatveganseat | Permalink. 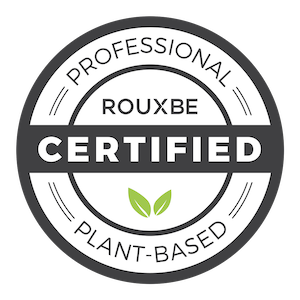 I have been feeling like I needed a new challenge, so I decided to jump in and take the Rouxbe cooking school professional plant-based certification course. I will be very busy for the next six months learning more about plant-based nutrition, knife skills, cooking techniques, and new recipes. Our first cooking assignment in class was to make our go to dish, one with which we are familiar and is in our regular meal rotation. I have always loved chili and now that we are plant-based, chili is almost an obsession for me. I not only eat it year round, but I always make a big pot and can eat it daily until it’s gone when most would put the leftovers in the freezer. In the fall, I love all of the sweet, colorful squash that is available in the local farmers markets and in the grocery stores. They are loaded with flavor, visual interest, and nutrients, such as Vitamin A and beta carotene. One cup of cooked squash has 457% of the recommended daily allowance of Vitamin A, and is a good source of fiber, potassium, and magnesium. One of my favorite squashes is butternut. I love it in chili as it adds a mild sweetness to contrast the spice of the chili powder, jalapeno peppers, and chipotle seasoning. Did you know that the butternut squash is a member of the cucurbitaceae family, which includes gourds and melons most likely originated in Mexico? Once called “the apple of God,” the butternut squash was prized by American Indians, who believed its seeds increased fertility. Australians refer to it as “butternut pumpkin” and it can be substituted in most recipes that call for pumpkin. Thanks to WebMD for these fun facts! About 1/3 cup of vegetable broth for sautéing your veggies. You can use water if you don’t have broth. Optional: Your favorite guacamole recipe to complement your chili or serve on the side with some baked oil free tortilla chips. Our favorite is Alton Brown’s Homemade Guacamole. We make it whenever we have rice and beans or chili. It is mouth watering good! Spread the butternut squash out on a baking tray covered with parchment paper or a silicone mat and bake for about 30 minutes until fork tender and lightly browned. While the squash is baking, sauté the onion and jalapeno pepper on medium high until soft, add veggie broth or water as needed to prevent sticking, add the garlic and sauté 1-2 minutes. Add the chili powder, chipotle, and cayenne and stir. Add the crushed tomatoes, fire roasted tomatoes, and kidney, pinto, and black beans. Turn the heat down to low and let your chili simmer. When your squash has finished baking, add it to the chili, along with the fresh lime juice. You can add cilantro to your chili to taste, or if you have friends or family who can’t eat cilantro because it tastes like soap to them, just put it on the table so folks can add it as desired. Top with guacamole or tofu sour cream as desired. Chili is so versatile. It is wonderful over rice, baked white or sweet potatoes, pasta, or even polenta. So, get your chili on and have fun with it! Make your chili your own with your own flavors and spice preferences. And, as always…Have fun with your food and enjoy! Categories: Recipes | Tags: #plantbaseddiet, beans, butternut squash, chili, eatmoreplants, guacamole, plant based, vegan, vegetables, veggies, whatveganseat | Permalink. Yes, he can cook! My husband made me a delicious veggie biryani tonight. He calls it Cheapass Fakeass Veggie Biryani. Cheapass because it is a very inexpensive and fakeass because it might not pass the test of authenticity in an Indian kitchen. However, I loved it and wanted to share it with you because it’s a no fuss dish that is delicious and can be made in minutes. Here’s his recipe! Well, we’ll see how this goes. I didn’t keep track of my amounts. I should’ve known Jean would want to blog this. Start with an onion, 2 cloves of garlic, and 1 1/2 cups of raw Basmati rice. Dice the onion, mince the garlic and sauté, adding several shakes of your favorite curry powder–we like Penzey’s. adding water and cooking according to the package directions. frozen Potatoes O’Brien (with onions and peppers!) 1 carrot (peeled and sliced), about 1 cup frozen broccoli, 1 c. frozen cauliflower, 1/2 c. frozen peas, and 1/4 c. of frozen corn. was making it. Sprinkle in some more curry powder with the vegetables. You can adjust the spices at the table if you want extra kick. We added some Sriracha sauce and I sprinkled some extra curry powder on my dish. Thanks to my plant-based husband for a great dinner and for sharing his recipe! Categories: Recipe, Recipes | Tags: biryani, health, plant based, Plant based diet, plantstrong, tofu, vegan, veggies, whatveganseat | Permalink. Last evening I was in the mood for a dish with tofu and I had time to drain it, marinate it, and chop the veggies for a stir “fry” which is one of my husband’s favorite things. I also had a bowl of fresh broccoli and broccoli greens that I had just cut from my garden. The greenhouse where I bought the broccoli plants told me that if I’m lucky, I may still be harvesting broccoli into January! The next step was to drain the tofu. I always use extra firm tofu for this dish and after I drain off the water, I slice it in 1/2 lengthwise, lay it in a colander, cover it with paper towels, put my family flat iron on top and ignore it for the afternoon. When I’m in a hurry I only drain it for 30-60 min, but it absorbs the marinade so much better when it’s well drained and has so much more flavor. Mix all the ingredients together in a small bowl, cut the tofu into bite sized cubes and place into a shallow dish. Sprinkle Chinese Five Spice over the tofu and then pour the marinade over the tofu. Let the tofu marinate for at least 30 minutes. Approximately 2-3 cups or more of broccoli, chopped along with the leaves if available. Preheat the oven or toaster oven to 450 degrees. If you don’t have the veggies in the ingredient list, use the ones you have in your fridge or garden! The possibilities are endless. Place the tofu cubes on a baking tray lined with parchment paper or a silicone mat, sprinkle with sesame seeds, and bake for 30-40 min until they are nice and brown. You can turn them if you like, but I prefer to leave them alone. Save the marinade! Using a slotted spoon, remove the remaining ginger and garlic from the marinade and set aside. Add ½ c. veggie broth to reserved marinade. While the tofu is baking, prepare your rice or pasta and keep warm. When the tofu is almost done, heat up your wok or a very large skillet. Add a couple of TBS of veggie broth or water to your pan and when it is hot, and the onions, peppers, garlic, ginger, and cook for a couple of min at high heat until the veggies begin to soften. Add the carrots, broccoli, and greens and cook for a couple of minutes until they are done to your liking. Add more veggie broth as needed to keep the veggies from sticking and help them to steam. When the veggies are done, move them to the sides of your wok or pan, and pour the reserved marinade into the center of the wok. Heat the marinade through and add the cornstarch that you mixed with water and let the broth thicken. Mix the sauce and veggies together. Add the Thai basil or cilantro. Place the rice or pasta in a large serving bowl, add the veggies, and top with the tofu. Serve with extra chopped Thai basil or cilantro and the lime wedges. The fresh lime adds a wonderful brightness at the table. Add extra Sriracha sauce or sambal oelek at the table as desired for extra kick! If you don’t have heart disease, you can add a couple of tablespoons of peanut butter to the reserved marinade. Remember this is your dish. Feel free to make changes and substitutions to accommodate your preferences AND what you have in your fridge and your cupboard! To save time, use frozen veggies or chopped veggies from the produce section of the grocery store. I hope you will love the Thai basil as much as we do. It’s aromatic, beautiful, and adds wonderful flavor to stir fry dishes. It also grows with little tending or care in the garden. Categories: Recipe, Recipes | Tags: #plantbaseddiet, garden, health, plant based, stir fry, thai, vegan, vegetables, whatveganseat | Permalink. Food. Health. Planet: The Connection! Fresh local food with Chef James Bolus! Microgreens: Powerhouses of Nutrition and Flavor! An RN with a passion for the plant based lifestyle. Plant based eating saved my marriage, strengthened my family, improved our health, and is a blast! Great Bunch o Lads with an allotment ! Delicious home food with a pinch of spice!